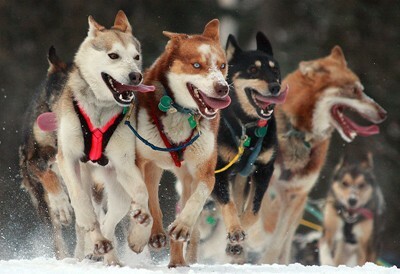 The Iditarod Trail Sled Dog Race is an annual long-distance sled dog race run in early March from Anchorage to Nome. Mushers and a team of 16 dogs, of which at least 6 must be on the towline at the finish line, cover the distance in 9–15 days or more. The Iditarod began in 1973 as an event to test the best sled dog mushers and teams but evolved into today's highly competitive race. The current fastest winning time record was set in 2011 by John Baker with a time of 8 days, 19 hours, 46 minutes, and 39 seconds.